NEWPORT, Ky. -- Northern Kentucky heads into 2018 with much on the horizon. It’s not all rosy -- a potential Duke Energy rate hike looms -- but Ky. Route 9 and Ky. 536 are expected to be completed, at last. And it’s Kentucky’s election year, where almost every state, county, city and school level position is up for grabs, not to mention seats in the U.S. House of Representatives. More and better roads: Traffic through the Newport on the Levee area is already improved as two roundabouts opened, and Monmouth Street is back to normal to 3rd Street. What’s next is the last leg of the new Ky. 9 from 9th Street to the 4th Street roundabout. It’s still on track to be open by this time next year, said Nancy Wood, District 6 public information officer for the Kentucky Transportation Cabinet. The route, conceptualized more than a decade ago, is expected to be a catalyst for Newport’s westside improvement plan. It’s expected to draw some traffic away from the Brent Spence Bridge as well -- all for $45 million. Ky. 536 (Mt. Zion Road) will be widened to five lanes along three miles toward Union, said Wood. The $26.1 million project will run from Interstate 71/75 west to US 42 and will include two roundabouts at Old Union Road and west of Golden Pond Drive. Both projects will have bike paths and sidewalks. Wood said Ky. 536 is expected to be completed in the fall. Electric and gas will cost more: Kentucky’s Duke Energy customers could an increase of 17 percent. Duke Energy filed a request for the increase with the Kentucky Public Service Commission in late November, and it was -- like most requests -- sent back for more information, said Andrew Meinykovych, director of communications for the PSC. There probably won’t be a decision until the second quarter of 2018, he said. “But (suppliers) rarely get everything they ask for," said Meinykovych. Expect some kind of rate hike, regardless. Votes count in 2018: The question is whether or not national issues will trickle down to the state’s partisan races (think federal tax plan or the upcoming state pension plan resolution). Not a lot of folks have filed in Boone, Kenton or Campbell counties to date, but anyone who wants to run in a Kentucky partisan race has until Jan. 30 to file. Independent candidates aren’t in the primary and have until Aug. 14 to file. One of the exceptions to the every-two-years vote is politicians with four-year seats, hence the mayor of Covington, Joe Meyers, won’t be on the ballot this time around. If there’s going to be major controversy, it will likely fall to the six seats open for the U.S. House of Representatives. Seven candidates have filed so far, and Northern Kentucky’s 4th District representative, Thomas Massie, is not among them. County clerks say the rush to file usually begins after Jan. 2. The primary is May 22, and the general election is Nov. 6. Click here to find who’s filed so far for all seats open across the state. 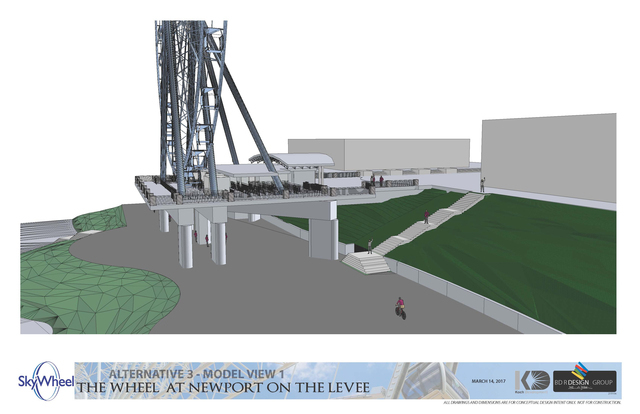 This rendering shows what the access entrance to Newport’s planned Skywheel could look like. Christmas skyline views — maybe: It is hoped the Newport Skywheel will open by next year and, with any luck, in time for holiday lights views. Open dates have changed several times during the process because it’s not especially easy to get the Corps of Engineers to agree on a plan that doesn’t intrude upon the flood wall. Tom Fromme, city manager, said the final plan is ready to be submitted to the corps by developer Koch Development in St Louis. Original plans for the 235-foot structure (about 21 stories) were submitted to the corps in January 2016. Changes were required by the corps last year to move forward. The Skywheel should offer a peak into the Great American Ball Park and 360-degree views. Giant step for health care: Northern Kentucky University’s Health Innovation Center is on track to open in July with its first classes filling the building this fall. The goal is to prepare future health care professionals with the changing landscape in treating patients, according to the univeristy's website. Anna Wright, director of public relations at NKU, said the project is currently on schedule and within budget. Besides health care education, the facility will be involved in everything from biomedical research to health care management, working with employers to help improve health and costs associated with their employees in Northern Kentucky. The building’s design is designed to optimize solar orientation and connects to Founders Hall via a four-story atrium. Design and construction costs totaling $97 million were approved in 2014 by the state, and St. Elizabeth Healthcare gave an additional $8 million for simulation labs. Driver’s license still OK to fly: Kentucky travelers won’t need any special ID to fly -- yet. Thankfully, the U.S. Department of Homeland Security gave the state an extension to deliver the Real ID, a new specially marked driver’s license being used by 27 states and territories already. Kentucky was supposed to comply by January but has been unable to make necessary equipment available to all county driver’s license locations. Without a Real ID, Kentucky residents were going to have to also show a passport to get on a plane at CVG. Real ID is part of federal regulations to combat terrorism. So far, the extension will last through Oct. 10, said Keith Buckhout, transportation cabinet spokesman. Buckhout expects the state will ask for a three-month extension, giving residents until January 2019 to comply with a new ID. “The goal is to not have any interruption (for residents),” said Buckhout. Pay attention though; consumers flying next Christmas and New Year’s may have to be compliant if they return home after Jan. 1. Old IMAX to concert scene: The Northern Kentucky Symphony will kick off a fundraiser in 2018 to help make the former IMAX theater at Newport on the Levee into their home concert venue -- for themselves as well as smaller concerts and performances. Although numbers aren’t final, they’ll need to raise $5 million to $7 million, said Executive Director JR Cassidy. The end result will be a 610-seat, very high-tech facility, he said, adding that ideas were “pie in the sky” right now. Cassidy said the process for making IMAX into a new space is slow. “These things never move at the rate of speed we wish they could,” he said, but that the theater’s owners were working with them to make a new venue. The location, however, is key for the symphony as well as other potential users. Easy access, parking and nearby restaurants and bars are all pluses. Another building will wrap up construction: The former Bavarian Brewery at 12th Street (MLK Jr. Boulevard) and I-71 in Covington is on its way to becoming the Kenton County Government Building by next December. Joe Shriver, Kenton County administrator, said the project is still on pace for completion in December with move-in by early 2019. Renderings from Turner Construction, which placed the winning bid for the project, show a design that retains part of the building’s historic castle-like facade, blending it with modern elements like above-ground parking. Most of the building was built in 1903 and 1909. It operated as a brewery until the mid-1960s. Kenton County Fiscal Court purchased the space for $4.5 million in July 2015.